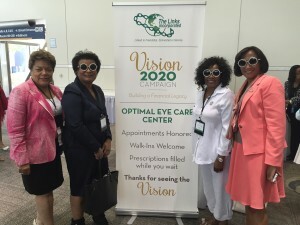 The Links, Incorporated consists of four main areas and has a membership of 14,000 professional women of color in 281 chapters located in 41 states, the District of Columbia and the Commonwealth of the Bahamas. The Links’ members are newsmakers, role models, mentors, activists and volunteers who work toward the realization of making the name “Links” not only a chain of friendship, but also a chain of purposeful service. The Dallas Chapter has received numerous letters of appreciation and recognition for service and contributions and has provided more than $200,000 in scholarships for high school students to continue their education. Some of the Dallas Chapter´s programs of impact include: The STEAM Academy, Links Locker at Paul Quinn College, and partnerships with the African American Museum and the Martin L. King Jr. Community Center. The Dallas Chapter has also financially supported over 50 community organizations that provide programs consistent with The Links, Incorporated and the Dallas Chapter´s program foci.